The father of a three-year-old girl who died following a house fire in Carmarthen has been discharged from hospital. Fire crews, police and an air ambulance were called to Bryn Gorwel in Carmarthen at 18:15 BST on Sunday. The girl's mother remains in a serious condition in hospital. The woman in her 20s was taken to Morriston Hospital, Swansea. The child died at the University Hospital of Wales in Cardiff. It took almost four hours to bring the fire under control with three crews - two from Carmarthen and one from Kidwelly - attending. 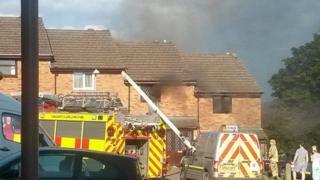 Eight firefighters wearing breathing apparatus tackled the blaze and a thermal imaging camera was used. Following the blaze, a neighbour said she ran into the street when she heard screaming. "It was chaos - everyone was screaming," she said. "The black smoke was horrendous and there were loads of flames. People were crying. "A man jumped out of the window and the mother was taken out by a fireman over his shoulder."